Richard A. Meiss, Ph.D., Speedway, IN, USA, who gave permission for his full name to be used. For a change from most negative feedbacks, this letter attempts to give an objection of substance. But as will be shown, it relies on the informal logical fallacy of argument from authority or Argumentum ad verecundiam (‘As a professional biologist …’) instead of performing elementary calculations, and like most evolutionists, misunderstands the vital point that evolution from goo to you via the zoo requires changes that increase genetic information content. His letter is printed first in its entirety. A response by Don Batten, Ph.D., also a professional biologist, of Creation Ministries International (Australia), immediately follows his letter (indented with point-by-point responses nterspersed as per normal email fashion. Ellipses (…) at the end of one of TM’s paragraphs signal that a mid-sentence comment follows, not an omission. I listened to your program of 6/14/01 entitled ‘Dogs—how many on the Ark?’. As I understand it, you are contending that the whole array of canine species, from wolves to jackals to foxes to canis familiaris arose in approximately 4,000 years from the genetic potential in just two animals. As a professional biologist, I can tell you that this is preposterous and points up the superficiality of your arguments. Since you deny the role of mutation in adding information to the genome, how do you account for the wide range of present-day traits arising from two individual genomes which could have had only two copies of each gene between them? Such silliness will certainly not give you any credibility to those who are unconvinced (and are competent scientists), and most of your true believers lack the scientific background to assess the validity of your spurious claims. I listened to your program of 6/14/01 [14 June 2001] entitled ‘ Dogs—how many on the Ark? ’. As I understand it, you are contending that the whole array of canine species, from wolves to jackals to foxes to canis familiaris [sic — I presume that a professional biologist knows that the generic name should be capitalized and this is just a typo] arose in approximately 4,000 years from the genetic potential in just two animals. Obviously these short radio programs do not ‘cover all the bases’. I suggest that you check out the rest of our website for the details of these things—it’s easy to do using the internal search engine and the Q&A tab which hyperlinks to about 50 topic categories. Ken Ham was saying that the variety of dogs, wolves, etc., could possibly have come from one pair—that there may have been only one pair on the Ark. Evidence of inter-fertility between different species of the wolf group is good evidence that they belong to the one created kind. There is no doubt that the number of basically different kinds of animals is much less than the number of species that have been named, so that one of the common scoffers’ arguments that ‘Noah could not have fitted all the animals’, is just hot air (see Q&A: Noah’s Ark). As a professional biologist, I can tell you that this is preposterous and points up the superficiality of your arguments. I am a professional biologist also, so this argument from authority doesn’t impress me in the least, and nor should it impress anyone else. I do not see anything preposterous or superficial about the argument. Perhaps it is not the biology that offends you, but the worldview that we stand for and your protestations are an excuse for denying the clear teaching of the Bible regarding the Creation, Fall and Flood. 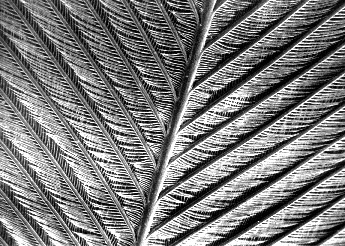 David Menton’s pictures above, under the scanning electron microscope, show the tremendous difference between feathers (top) and scales(bottom) [both magnified 80 times]. Here we have a confusion of different issues. Do mutations contribute to the variety we see in things such as domestic dog breeds? Most certainly — see Is Your Dog Some Kind of Degenerate Mutant?. However, does this give support to belief in molecules-to-man evolution? Most definitely not. The sort of variety created by mutations (for example, hairless, pushed in face, stumpy legs, etc.) is due to loss of information, not the addition of new genetic information. 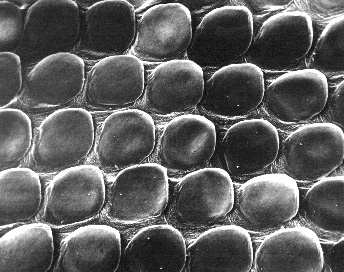 This is not the stuff that would change a lizard (or a dinosaur) into a bird, for example — this requires the addition of the specifications (coded in the DNA) for making feathers (see scannning electron micrographs, left), flow-through lungs connected to hollow bones, bird-brains, etc. As Dr Lee Spetner has pointed out in his book (Not By Chance) and refutations of sceptics, no one has yet found a mutation that adds new complex coded heritable information to any organism. If mutations are really responsible for all the information added to a microbe to make a man, there should be plenty happening today that could be observed. … arising from two individual genomes which could have had only two copies of each gene between them? Actually, two genomes (male and female) could have four different alleles (variety of a given gene) between them for each gene locus, not two. Since you say you are a professional biologist, I assume you just made a simple mistake here and you actually do understand the principles of genetics. Now, there are probably some 30,000 genes in a wolf/dog, and if every gene locus were heterozygous (two different alleles), then for each gene there are 10 possible pairs of four types of allele (if the alleles are A, B, C, D; then the possible pairs can be easily tabulated: AA, AB, AC, AD, BB, BC, BD, CC, CD, DD — for n types of allele, the number of possible pairs is n(n+1)/2). With the recombinations due to sexual reproduction, this amounts to a potential number of different genotypes in the descendants of 1030,000 (this is 1 followed by 30,000 zeros). To put this in perspective, there are thought to be some 1080 atoms in the Universe! So, it appears that two wolves could produce quite a few descendants before the pattern would have to be repeated! Now because not every gene locus is likely to be heterozygous in the original pair, and because of recessive alleles not every gene will be expressed, so the number of animals that could actually be different in their form (‘phenotype’) would be less than the huge number above. But let’s be ultra-generous to the evolutionist. I.e., let’s assume (as you claimed) that there were only two types of allele per locus, and that there was no co-dominance so only two phenotypes per locus, and there was only 1% heterozygosity in wolves/dogs (cf. 6.7% in humans even today, presumably much less than in Adam and Eve), the number of possible varieties would be 2300 = 10300(log(10)2) = 1090. Even with these conservative figures, this number is still so huge that it makes the number of atoms in the universe seem like a tiny smattering — 1090/1080 = 1010 (10 billion) times larger! So it seems like there would have been plenty of genetic potential to produce all the members of the wolf kind that we see today. And if to this we add the degenerative changes due to mutations, we have more than ample capacity in two animals to produce all the varieties of dogs/wolves/jackals that we see today. … will certainly not give you any credibility to those who are unconvinced (and are competent scientists), and most of your true believers lack the scientific background to assess the validity of your spurious claims. Actually there are plenty of competent scientists, including professional biologists, who accept the Bible’s authority, including the accounts of Creation, the Fall and the Flood; and of course creationists were responsible for founding most branches of modern science, including biology. This is well documented in our creationist scientists page. And I know laymen who understand these basic issues of genetics better than some supposedly ‘professional biologists’. In fact, one Professor of Genetics at a university was shocked into reason by his wife, who has no academic qualifications — like you, he scoffed at her supposed ignorance, but God used something she said to break through his evolutionized outlook (see Jumping Ship: A geneticist tells of his ‘double conversion’). Perhaps it is not the credibility of our teaching that is a problem but that you are ‘wilfully ignorant’ of things the Bible teaches (2 Peter 3:5). This scoffing derision comes from a determination to follow one’s own evil desires (2 Peter 3:3) because to acknowledge the truth of the Bible would mean having to submit to the One who inspired it, admitting that you are guilty in His sight, deserving of His judgment and in need of the forgiveness He has made available through Jesus Christ. Such a profound change (conversion) would not make one the flavor of the month with one’s fellow scoffers! It would be a very difficult decision, but it needs to be done! Jesus said to follow him would be costly (John 15:18–21 cf. 2 Timothy 3:12), but He is the only way to eternal life (John 14:6, Acts 4:12).